Have you ever looked and critically thought about the heart shape? Honestly, it doesn’t much look like an actual heart. I read once that the heart shape may have actually started as a leaf shape bringing to mind life and renewal. Regardless of where it comes from and what it initially meant, the heart is a permanent icon today. We see the use of this shape in quilting in many forms. You can applique it, piece it, or simply quilt it. In one way or another these renters added hearts to their quilts. Pamela used this sweet little split rail fence for her certification class. I’ve always loved the use of black with bright colors. The bright blue border really frames it out nicely. Pamela’s use of the heart shape? It is in the quilting! Because of the solid color, you can see it better in the border. Pamela used a design board we have for the longarm machine renters. It has some fun little flowers and creates hearts in the wishbone style turns. It is a great design for tops with a whimsical light feeling. The use of hearts on this quilt is obvious. Colleen quilted this with a simple meander design we have called Seamless. It is just a simple loopy meander, but this quilt didn’t need any additional design for it. Besides the variety of reds, I love the addition of black applied evenly throughout the quilt. It keeps it balanced and adds that pop that we usually associate with red. I also like the fact that she has incorporated a red and white prints with solid white background fabric. It allows the designs on those prints to just float on the surface. Beautifully done Colleen. This is another quilt where the use of heart is not in the piecing. Rebecca made this lovely Dresden style quilt. I like the fact that she fussy cut butterflies for the center dot in all the plates. The variety of whites plays to the scrappy nature of the quilt and the dark outer border frames it all nicely. She quilted this with a paper pantograph called Heart Fancy. It is a lovely open design with large hearts and swirls. Linda made this bargello quilt into the shape of a heart. The colors are beautiful together. Purple has always been a favorite of mine, but the pairing with the blue just makes the whole thing feel light and cool. I especially like the white ring around the heart to set it off from the rest of the rings. So pretty! She also quilted this with the paper pantograph Heart Fancy. It adds to the theme of the quilt perfectly. Quilting is a hobby that you can really put your whole heart and soul into. 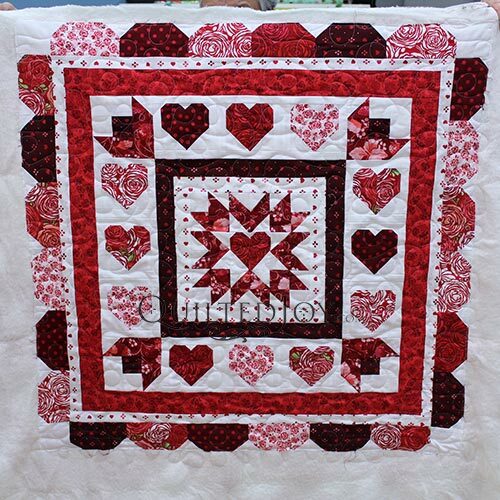 Whether figuratively or literally, try adding a little heart to your next quilt. Previous post: Rule Your Quilts with Rulers!